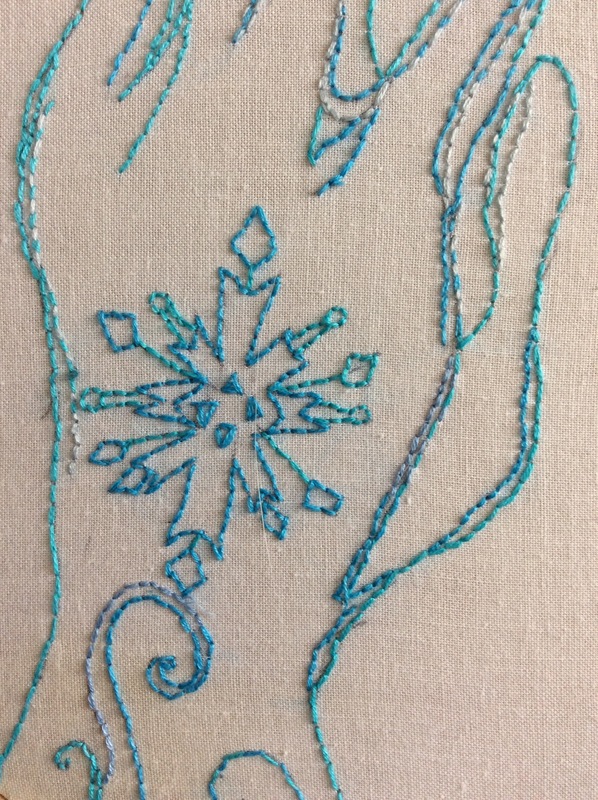 Just because winter is technically over does not mean that you can not (and should not) keep creating in fiber. 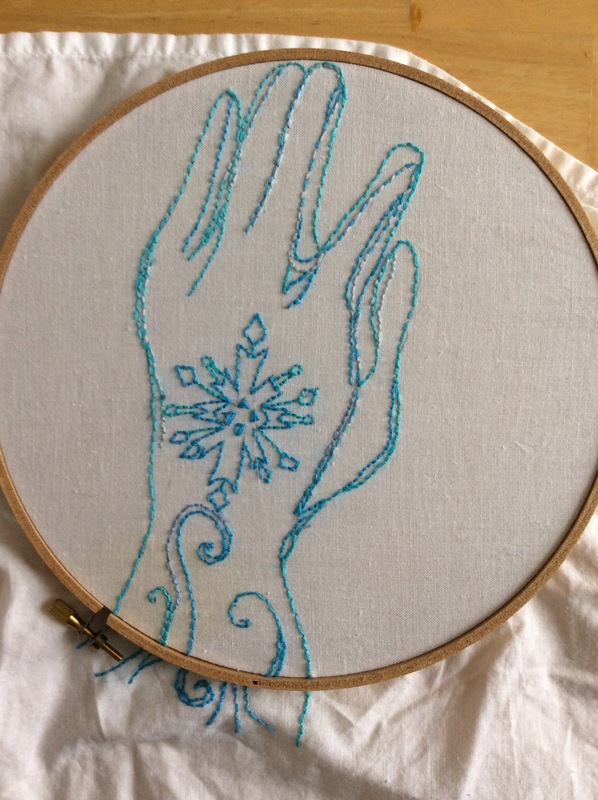 One of the reasons I love embroidery is for its versatility. As fun as it is to sit stitching by the fire, light-weight fabric such as cotton also makes for a great spring and summer medium. But only just finished it a few weeks ago. 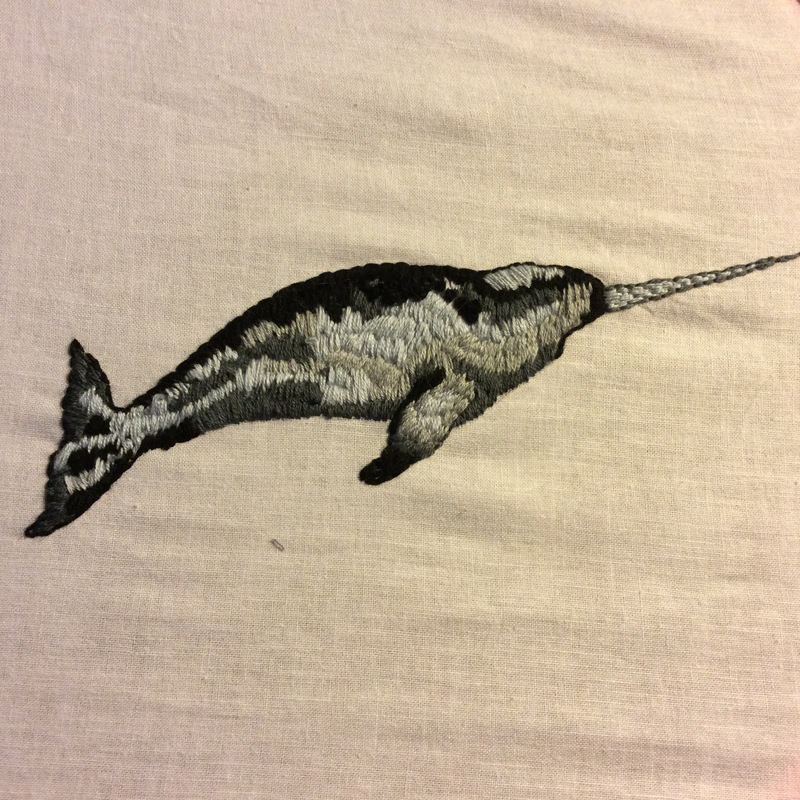 As I’ve mentioned before, embroidery (while rewarding) is very time consuming. The lag time is also due to a hectic schedule and the medium’s ability to be put down and picked up at any point in time. 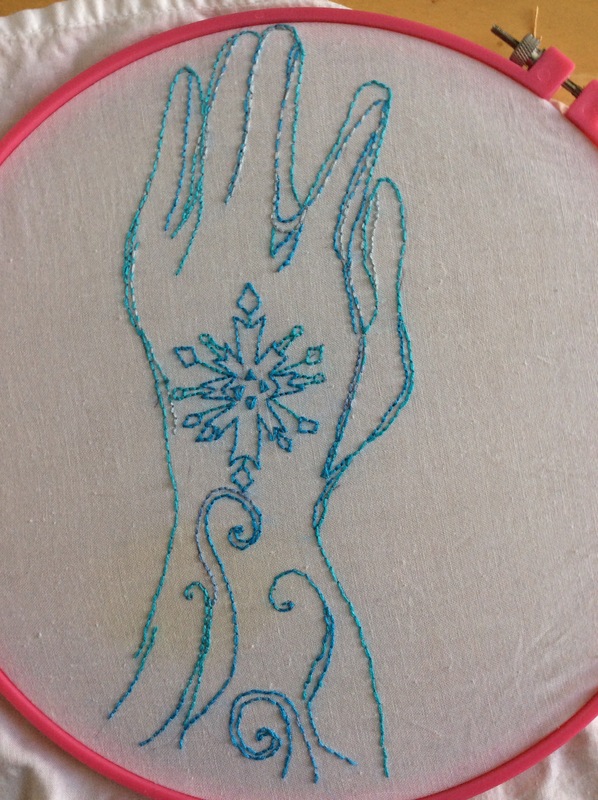 That being said, I always make a point of having an embroidery project going year round. Because picking up a project here or there will ultimately result in a well-made piece. Not to mention a pleasant surprise on the day it’s actually finished! Fibernation post #4! 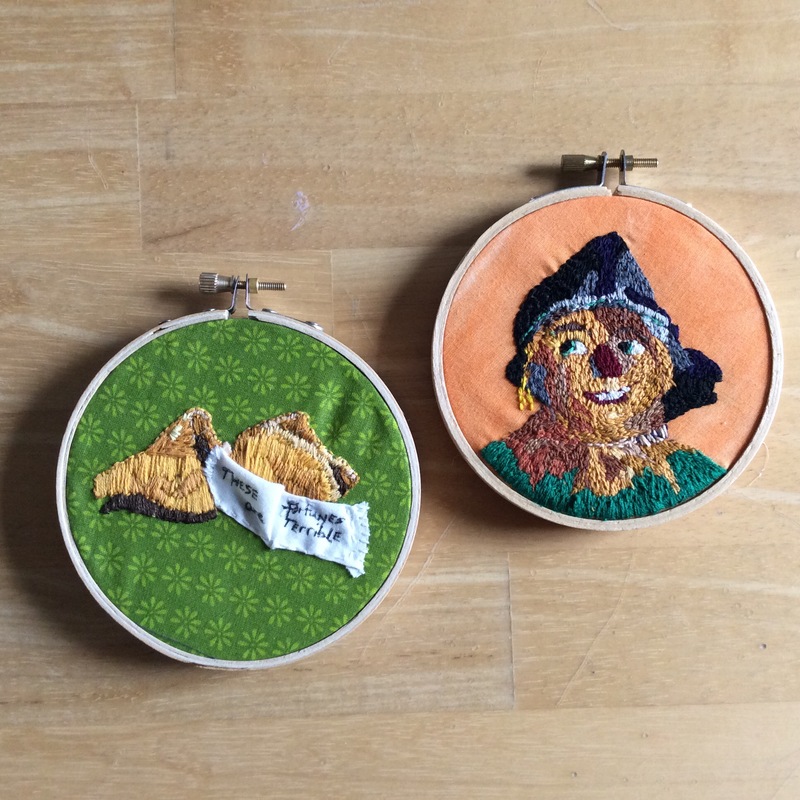 So far, I have given you two different embroidery-oriented posts. Today’s post is an example of something I have become a huge fan and practitioner of: mixed media. As I have mentioned before, I do not have my own studio. What I do have is a kitchen table.This means that I am always looking for house-friendly forms of art. 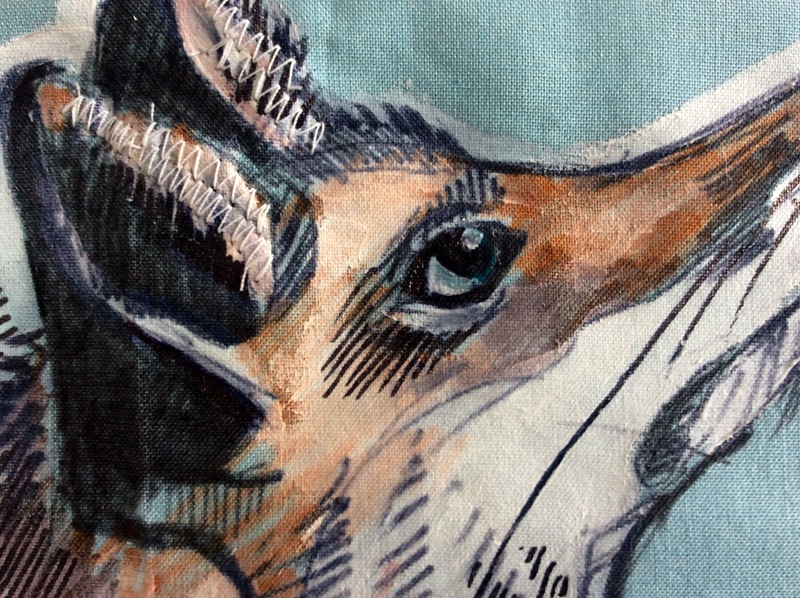 While there are many different forms of mixed media, one of my favorites has grown out of the combination of paint, ink, fabric and embroidery. Although foxes have become trendy over the last couple of years, they have always been one of my favorite animals. I loved them so much in fact, that as a child I begged my parents for a fox costume, not unlike the one worn by one of Peter Pan’s lost boys. Inspired by this animal, this piece came together relatively quickly, only taking a couple of hours from start to finish. Having drawn the feathers and the fox in black marker, I was able to smear and smudge the ink using white acrylic paint and a rubbing technique with a paint brush. By doing so, I was able to create a sense of depth and form that was lacking in the line drawing. 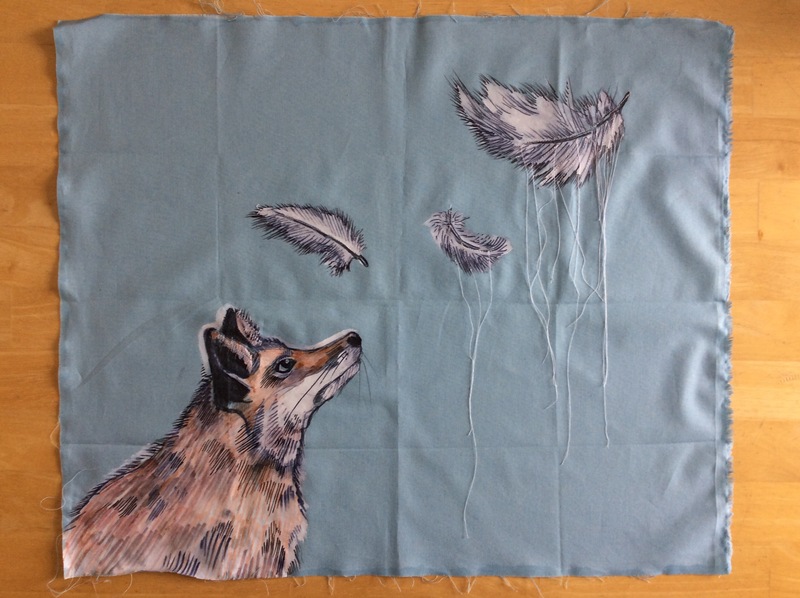 I finished the piece by using my sewing machine to embroider over two of the feathers. While I had considered embroidering the fox, I did not want to clutter the piece, so I only added embroidery to his ears. I am quite fond of the simple composition and did not want to ruin it. Another reason I love this piece is because it reminds me of what art is really about: creativity. There are those in the art world who believe mixed media is a cop-out, and that if you are a true artist then you should be able to communicate through a single medium. I, however, believe the opposite. To limit one’s creativity, in media choice or otherwise, is to limit the whole purpose of art. So whether you are creating in one media, or two, or ten, it doesn’t much matter, so long as you are creating. Fibernation post#3! I am posting quite early this week as I will be in NYC Wednesday-Friday for the S.I. Newhouse School of Public Communication’s annual public relations benchmark trip. 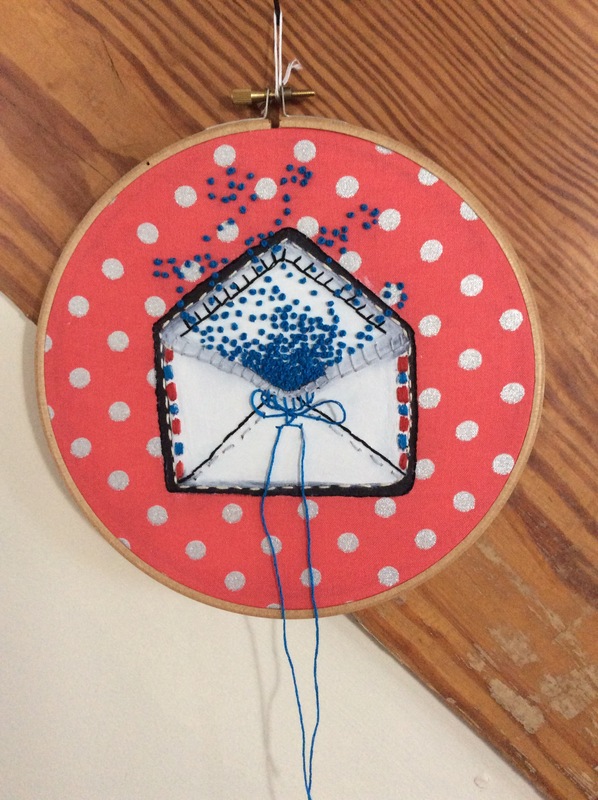 While making art is a ton of fun, making it hanging-ready is usually anything but. 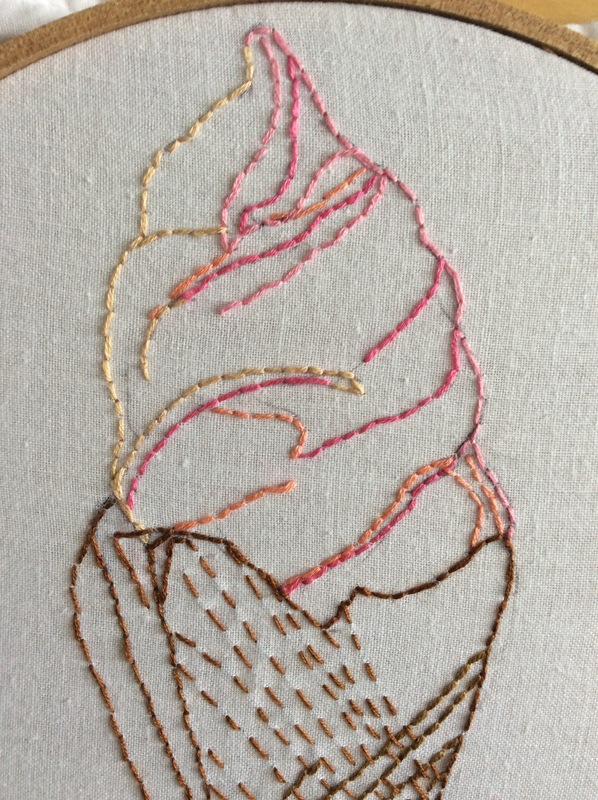 Thankfully, for you fiber artists out there, embroidery is one of the absolute EASIEST things to make exhibition ready. It is also one of the cheapest (which is always a plus)! 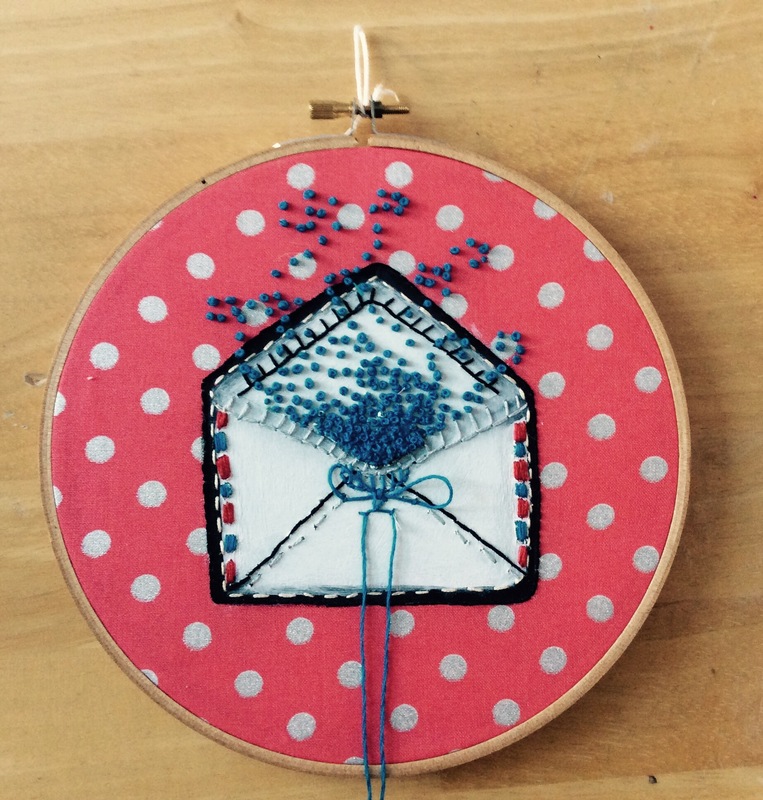 Trace your embroidery hoop onto a piece of felt. Cut just inside the line. 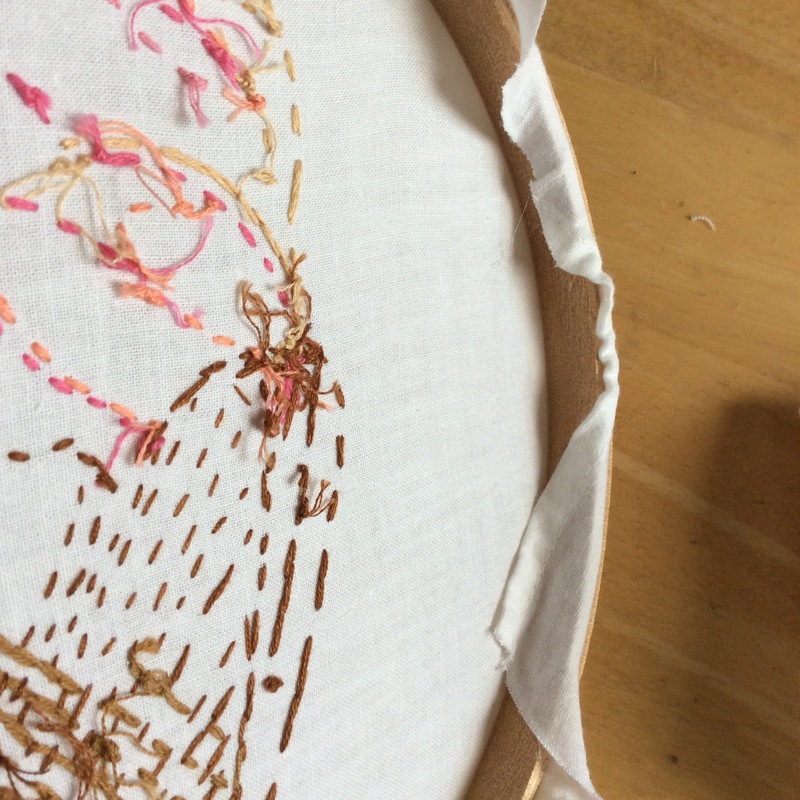 Place your hoop (embroidery piece secured inside) face down. 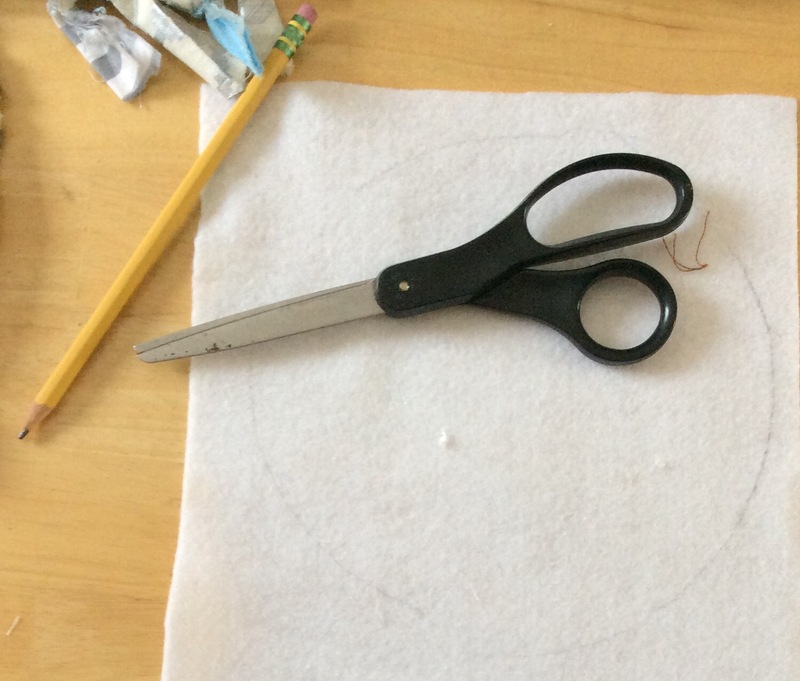 Cut your fabric close to your hoop, leaving just enough material to fold over the hoop. Begin folding the fabric and gluing it to the inside of the hoop, doing only a few inches as a time. Once you have gone all the way around place the felt circle inside the hoop. Slowly, begin gluing the felt to the inside of the hoop. Once you have gone all the way around the hoop, allow the glue to dry. VOILA! Your piece is now hanging ready. 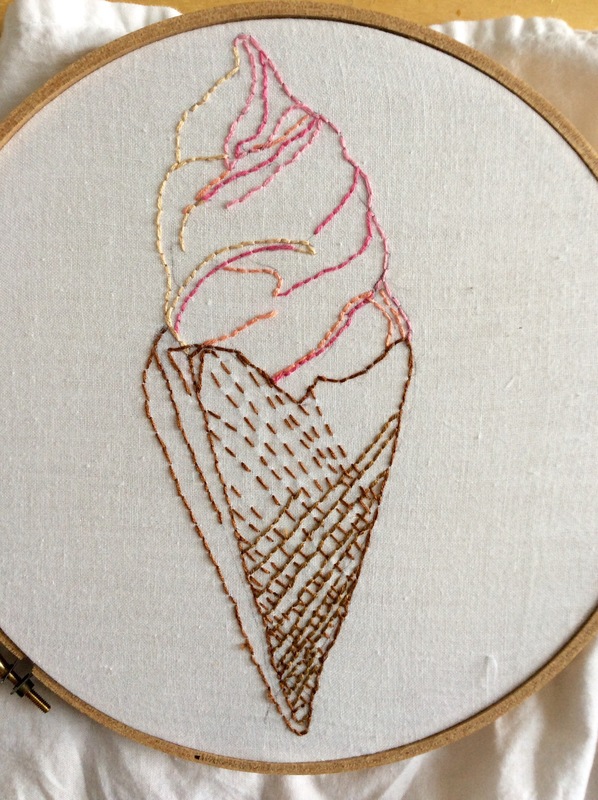 I sincerely encourage all of you who have any interest in fiber to try embroidery . You might be surprised by how much you enjoy it, and nothing is more satisfying than seeing your work on display, even if it is only within the confines of your own home.